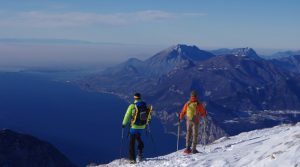 So you are probably asking yourself where is the nearest ski slope to the area of Lake Iseo and what type of skiing can you do……, ahh well the best kept secret of Lake Iseo is that it is literally surrounded by beautiful mountains and tranquil alpine trecks that you can enjoy all year round. From Cross country Skiing to Alpine Skiing and Snowboarding you can enjoy all these family sports just a short drive from Lake Iseo. The closest is probably Val Palot, just 12 kms from the town of Pisogne, on Lake Iseo, Val Palot at 1100meters high dominated by Mount Gugliemo with breathtaking views, can be reached comfortably by car and offers an authentic corner of paradise for those who enjoy nature and serenity. 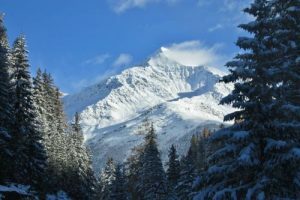 Val Palot is blanketed with a white cape of snow in the winter for the joy of all skiiers. There is an artificial plant system that guarantees good skiing all the way up to the month of March. In the summer it is appreciated by those who enjoy taking a quite stroll or for those more adventurous out there, Nordic walking and trekkers and even joggers. For those who wish to take a weekend break in this nature paradise, there are 2 hotels and an agriturismo ( working farm house ) which also produce a number of delicious cured meats and cheeses especially around the area of Bionda dell’Adamello. Montecampione is a popular modern skiing village situated in the heart of the Val Camonica, Brescia, which surrounds Lake Iseo. Around 60 kms from Brescia, Montecampione is easy to reach by car and is around 11kms from the Tonale Pass in the direction of Darfoe Boario. 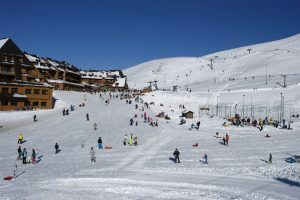 Those who like to ski can enjoy the 30km of ski slopes, amongst which are 4 black runs, 12 red runs and 4 blue runs and plenty of mini slopes for children and beginners. For those who like skidoos there are plenty of tracks at a quota height of circa 1800 meters. There is the possibility of taking the ski lifts from the village so you don’t need to take the car and an artificial snow plant guarantees good skiing until March. 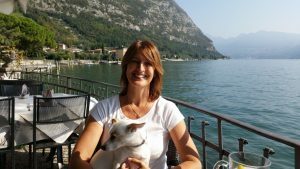 This ski station holds many competitive events annually and is really worth a visit should you be planning to go skiing on Lake Iseo. A fairy-tale landscape, perfectly groomed slopes, modern lifts, sun, snow and fun are the ingredients of the district of Adamello Ski. These four ski stations, Temù (from m. 1121), Pontedilegno (from m. 1255), Passo Tonale ( m. 1880) and the Glacier Presena ( m. 2585), are one beautiful compliment of diversity and each reality offers a haven of complete tranquility and enchanting landscapes. The slopes are suitable for skiers of all levels, from beginners to professionals, suitable for those who like steep slopes or those who prefer to ski with a quiet confidence on the gentle slopes. A carousel of ski emotions from the smallest slope in Temù at 1,000 meters high up to the most adventurous slopes of the Presena at 3,000 mt high . 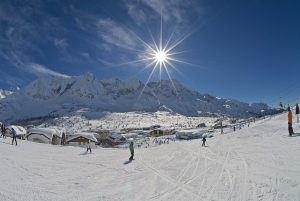 Adamello Ski, where snow and sun are always home features with 30 modern and fast ski lifts, over 100 km of perfectly groomed slopes are taken perfect care of with great professionalism, one ski pass which offers a winter dream in a four beautiful natural oasis of peace and relaxation with sun and great skiing. Many of you who have already visited this lake probably think it’s a quiet place with very little to do, well that would be a mistake as this little’ole lake has quite a lot going on. The company ‘You can do it’ run by Alpine Guides and experts of this area, Ruggero Andreoli and Franz Carrara have some fantastic activities for the dare devil and adrenaline junkies out there. Iseo express run a transfer service from Milan-Bergamo airport to Lake Iseo and Lake Endine, its easy, cheap and quick – check out www.iseoexpress.it or if you want to have a personal driver and unique experience you could contact Marco Moraschi at www.iseotaxi.it – he speaks perfect English and would be able to entertain you with his wit and humour throughout your whole trip.